The satanic wave of egalitarianism, which, from the sixteenth-century Protestant revolution to the communist revolution of our time, has been attacking, slandering, undermining and depleting all hierarchy and anything that symbolizes it, presents all inequality as an injustice. It is in human nature – egalitarians claim – that man feels diminished and vexed when bowing before a superior. If he does so, it is because certain prejudices or economic circumstances compel him to. However, this violence to the natural order of things does not go unpunished. The superior deforms his own soul with the arrogance and vanity that lead him to demand that someone bow before him. For his part, with his subservient gesture the inferior loses something of the elevation of personality proper to a free and independent man. In other words, whenever a person bows before another there is a winner and a loser, a despot and a slave. Catholic doctrine tells us the exact opposite. God created the universe according to a hierarchical order. And He established that hierarchy should be of the essence in every truly human and Catholic order. In contact with the superior, an inferior can and should pay him all due respect without the slightest fear of lowering or degrading himself. On the other hand, the superior should not be vain or overbearing. His superiority does not stem from strength but from a very holy order of things desired by the Creator. Customs in the Catholic Church express this doctrine with admirable fidelity. In no other context do rituals and formulas of politeness consecrate the principle of hierarchy more sharply. And in none can one see so clearly how much nobility there can be in obedience, how much elevation of soul and how much kindness there can be in the exercise of authority and preeminence. 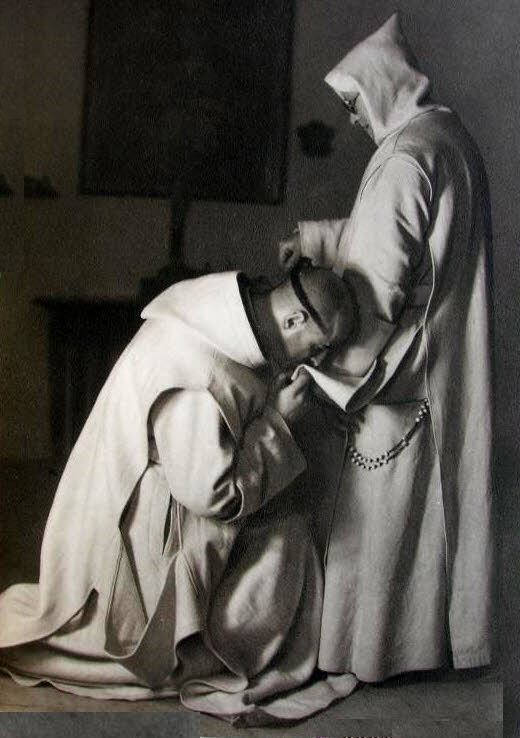 In a Spanish convent of Carthusians, kneeling down, a monk kisses the scapular of his superior. It is an expression of most complete subjection. However, when you consider the scene carefully you see how much manliness, personality, sincerity of conviction, and elevation of motives the humble kneeling monk puts into his gesture. It contains something holy and chivalrous, grand and simple, which makes you think of the times of the Golden Legend, the Song of Roland, and the Fioretti of St. Francis of Assisi. Kneeling, this humble and unknown man religious is greater than modern man, an infatuated, impersonal, anonymous, inexpressive molecule in the great amorphous mass which contemporary society has become. Having looked at the monk’s humility, let us consider that of a gentleman. 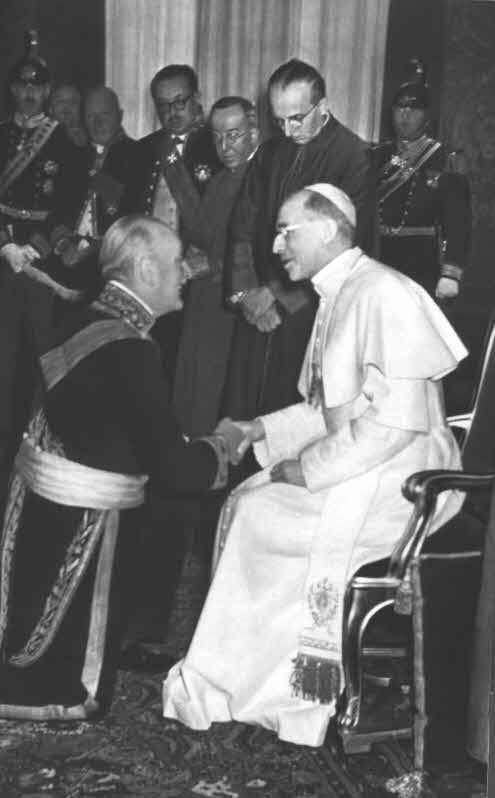 Count Wladimir d’Ormesson was French ambassador to the Holy See until very recently. In our picture, we see him donned in solemn diplomatic attire kneeling before the Holy Father Pius XII during an audience. It would be difficult to imagine an attitude that so fully expressed such a high awareness of one’s own dignity and at the same time,a lively respect for the hallowed and supreme authority the ambassador has the honor to meet. His knee on the ground, but his upright trunk and neck, and the nobility and reverence of his greeting, everything shows how much respect and dignity is found in the traditional diplomatic styles elaborated in the golden ages of Christian civilization, and of which the Count is here a faithful interpreter. Now, consider the Prior. There is a kind of contrast between his great white figure, erect, robust, stable, expressing authority, assurance and paternal protection, and his physiognomic expression that seems neutral, impassive, serene, a little distant. The figure expresses the Prior’s official attitude. His physiognomy translates the detachment and simplicity of the man. For that homage is not directed to the man as such but to his office. And, with all due respect, let us consider the position of the Pontiff. Sitting on a small throne, he does not get up to receive the ambassador’s homage. However, he lightly inclines to get closer to the Count and keeps his hand in the latter’s, giving the whole welcome a very marked note of kindness. And while remaining entirely Pope, he shows for the ambassador a most ingrained benevolence and the greatest esteem. Here we have four attitudes inspired by a very hierarchical view of things. 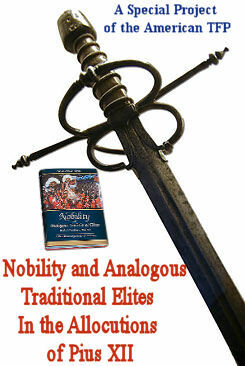 All are noble, dignified, honorable, though each in its own way. In a word, such is the splendor of Christian humility and the beauty of hierarchical life.